32 pages of U.S. military documents, maps, graphs, and reports. Size: 9 in. x 6 in. x 1 1/8 in. This book provides a walk through Hiroshima today. 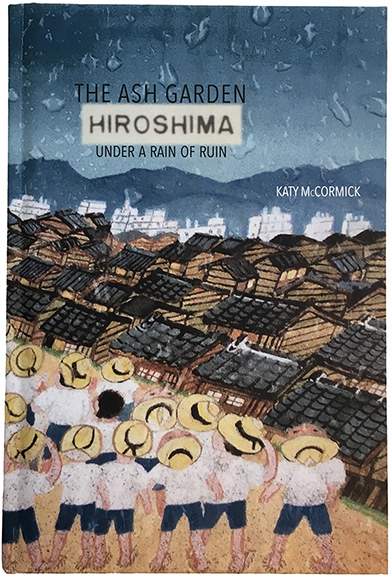 Foregrounding both the documentation of the disaster and the sites in present time, The Ash Garden aims to address the invisibility of atomic bomb histories in North America, as the survivors and their memories disappear in Hiroshima itself. Using an approach reminiscent of the early A-bomb surveys, the proposed publication presents photographs of “A-bomb Disaster Markers” and the sites in which they are situated, sequenced from Shima Hospital, Hiroshima’s ground zero, to Miyuki Bridge, some 2,300 meters away. This systematic arrangement provides a framework for reflecting upon Hiroshima’s history, past and present, while also probing photography’s limitations in representing the invisible. While the plaques testify to the effects of the bomb, they also attest to the strategic selection of Hiroshima as a target. Having been purposefully spared from conventional bombings, it provided an ideal testing ground to gauge what happens when an atomic bomb is detonated over a populated city.